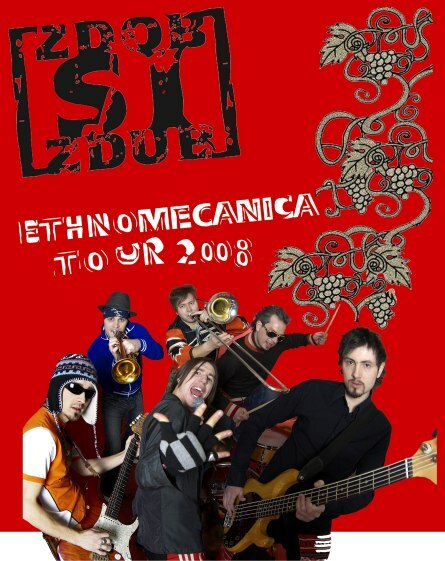 At the end of 2007, the Zdubish album “Ethnomecanica” was released at “Sojuz” Record Label, in Russia. Before that, the album had been already released in Romania and Moldova. On the 28th of March, 2008, the album release will take place in Germany, Switzerland and Austria, under the “Lawine Records”, being distributed by “Sony BMG”. At the moment the band is getting ready for the tour supporting the European release. The first concert in the framework of this tour will be held in Moscow, on the 5th of April, in the club “B2”. Cities from Hungary, Austria, Germany and Denmark will follow. The Moldovan rockers are waited in Budapest, Vienna, Innsbruck, Munich, Berlin, Hamburg, K?ln, Dortmund, and Copenhagen. The tour will end in Leipzig, on the 26th of April, in the club “Ut Сonnewitz”. In May the Zdubs will be working in the studio on their new material and, after this creative break, they will jump into the summer tour of festivals. Detailed information on the band’s concert can be found on the official website.